Validation Protocols and Associated Documents. The VMP is not mandated by the FDA, but is always asked for in regulatory reviews and inspections. (URS - DQ - VRA) are mandated and self explanatory. With the Installation Qualification (IQ), Operational Qualification (OQ), Performance Qualification (P1Q) and Process Qualification (P2Q), there is a degree of flexibility as regards to the content of these documents. Although the document title clearly defines it’s scope, it is possible and permissible to arrange some elements of testing in the most expedient sequence. I.e. do you wait for power 'on' to do IQ, perhaps? Perhaps not? It can be argued that when power is on you are operating the equipment (so power on testing should be in the OQ). Can IQ therefore be completed prior to power up? It can, and often is, hotly debated whether all the testing carried out in the FAT, SAT and commissioning stages, must be repeated in the equipment qualification. (i.e. are you going to repeat some of the testing four times?) This is where the VP becomes a vital document. Senior persons with a good understanding of the overall project, can decide the content and scope of each of these documents, obviously within the framework of existing cGMP legislation and guidelines. They can actually develop a quite unique sequence of equipment qualification tasks for a number of reasons (to reduce repetitive testing - to ease access problems – to sequence with other activities, and on), providing that their rationale is documented in the VP and posts a plausible justification. The VP is then used by the protocol writers as the official mandate for protocol content. 1) What does IQ OQ PQ Stand for? Installation Qualification. Operational Qualification. Performance Qualification. 2) What is Equipment Qualification Protocol? There is no subject so it cant mean anything. 3) What is OQ Test? The OQ is a whole series of tests used to verify that item under qualification possess all the functional requirements detailed in the URS. 4) What is URS document? User Requirements Specification. Level 1 - End users requirements. Level 2 - Support structure for Level 1 (Calibration, Maintenance, Training, Utilities. Level - 3 Software traceability. Equipment Qualification and Integrated Bespoke Software. In the diagram below it can readily be seen that the URS, along with the regulatory requirements as detailed in GAMP 5, and the details of validation requirements as given in the VMP, come together to form a package from which the vendor can develop a fully legal, compliant and validateable product. Equipment qualification templates are available for the activities shown grouped in the two colours (orange and blue). The blue color is the requirement for standard computer validation, while the orange color depicts the additional equipment qualification templates that are required when the process executed by the during equipment qualification has been identified as critical. The FDA regulators have decreed that software used in a manner that can affect the quality of the product, without leaving visible evidence, that damaged has occurred, must be deemed as critical to the quality of that product. 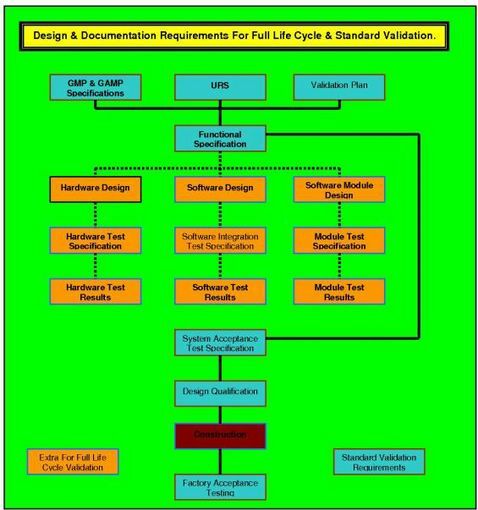 The regulators have further mandated that all such software be identified as such - and subjected; from concept to actual use, to Full Life Cycle Validation (FLCV) requirements. This additional level of validation requires the addition of further validation GMP qualification templates as portrayed in the diagram in orange. The vendor therefore (be they in, or out, of house), must produce a Quality Plan that ensures the software development will follow a validation evolution similar to that shown in the diagram. Your actual diagram must be planned and justified for the software system that you are proposing. It is of paramount importance that your decision on software criticality is documented, and that your Quality Plan (QP) is reviewed and approved by QA, and the client or their representative, prior to initiation of the design process. Since these documents all form part of the equipment qualification process, you must expect regulatory inspectors to be interested in reviewing the content and the format of them. All regulatory required FDA Compliant documentation must be carefully prepared, with statements worded to preclude ambiguous and incorrect interpretations of the purpose of the statement. In addition there are quite separate requirements stipulated by the regulatory authorities. Documents presented to regulators during inspections that fail to satisfy these requirements, indicate to the regulator a lack of care and commitment on the part of the company. The exact opposite to what is required. The FDA and regulatory authorities in general, are charged with increasing the level of compliance throughout the industry. This call for increased regulatory compliance, is driven by evidence that the industry is failing to match the standards set by other regulated industries. Validation Online, have designed unique interactive documents for all validation activities such as VMP, URS, IQ, OQ, PQ, and many others. These documents have all been designed to be cGMP, compliant, along with incorporating the structures the regulators look for. These documents are realistically priced to ensure it is much more cost effective for companies to download documents as they require them, than individually author them.